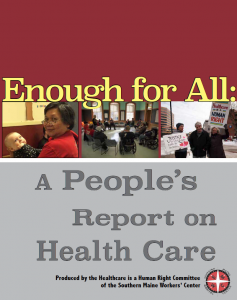 The Health Care is a Human Right committee is proud to release our grassroots report Enough For All: A People’s Report on Health Care. This report is based on thousands of grassroots conversations we’ve had over the last four years. It represents an extended network of people who have been vulnerable and brave in sharing the ways the system has let them down, and in contributing to a vision of something better. What we’ve found is that most people believe that Health Care is a Human Right and believe that the government should enact policies that uphold that right. Why are so many of our public officials out of sync with the interests of their constituents? How do we change this? If you believe like we do that there is ENOUGH for everyone to get the care that they need, then join us. Click this link to learn how to get involved in our movement.